Manchester City striker Sergio Aguero is expected to be out for a month after undergoing keyhole surgery on his knee. The Argentine, 29, has been troubled by the problem for the past five weeks and missed Saturday's 3-1 win at Tottenham. "Recovering from an arthroscopy on my knee. Fully motivated to get back soon to the field," Aguero wrote on Twitter. 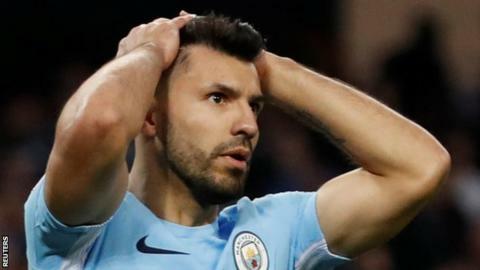 It is anticipated that Aguero, who has not started a game since City's victory over Chelsea on 4 March, will be fit for Argentina's World Cup campaign. "I don't know if he will be ready for Swansea [on April 22]. Hopefully for the last games, if we need him, and especially for the World Cup."